"This is a Puerto Rican recipe. 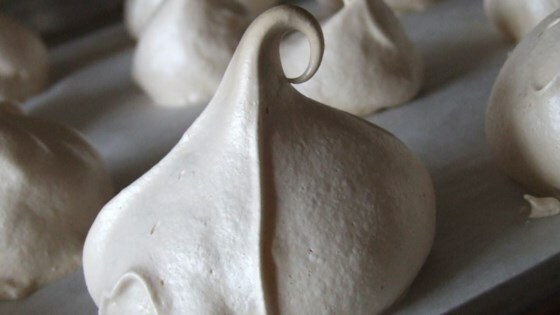 The meringues are as light as a cloud and not messy, you can make a lot of them, and they have a hint of lemon." Preheat the oven to 275 degrees F (135 degrees C). Line baking sheets with parchment paper. In a large clean glass or metal bowl, whip the egg whites with salt and cream of tartar until they can hold a soft peak. Gradually sprinkle in the sugar while continuing to whip to stiff peaks. Fold in the lemon zest. Drop by heaping spoonfuls onto the prepared baking sheets. Bake for 35 minutes in the preheated oven, or until they peel off of the sheet without resistance. Cool on wire racks, then store in an airtight container at room temperature. See how to make delicious fresh berry bars. They were a little too sweet for me. I wish I would have put in 1/2 or 2/3 the sugar. Wonderful! I've made this recipe twice now, once with orange zest and once with lime zest and it was delicious each time. Crunchy on the outside, soft in the middle - perfect! I added lemon extract with the zest. They melt in your mouth.